The floppy might be dead, but that didn't stop one clever hardware hacker from modifying a floppy drive to read multi-gigabyte SD Cards. You thought the floppy disk was long dead. You thought that, in today’s cloud-centric age—a time in which even miulti-gigabyte flash drives are ridiculously inexpensive—that the humble 3.5-inch plastic-encased disk would be a relic. You’d be right. But that didn’t stop one ingenious soul from trying to bring it back. Meet the 126GB floppy drive. This clever hack comes to us thanks to YouTube user Dr. Moddnstine (via Geek.com), who hacked an SD Card into an old floppy drive. And believe it or not, it actually works! According to a video Dr. Moddnistine posted to YouTube, the surprisingly spacious floppy drive fits into a standard 3.5-inch floppy drive and mounts like an ordinary floppy drive. A photo album Dr. Moddnstine posted to Imgur describes the floppy-SD Card hybrid in more detail. 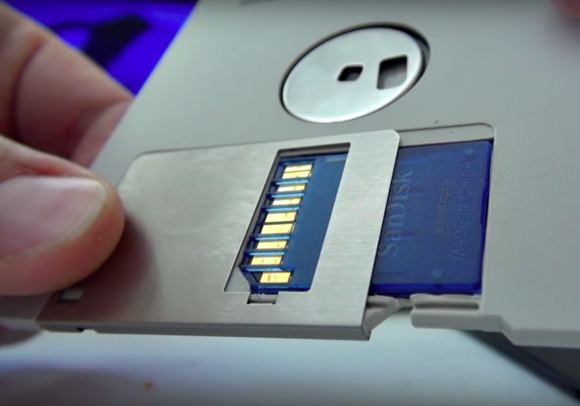 The process involved cutting out a notch in a 3.5-inch floppy disk to make room for the SD Card—the sliding door acting as a shield for the SD Card’s metal contacts. Hacking the drive itself to support the SD Card took a little work, but Dr. Moddnstine noticed that “the 5.25 floppy edge connector had the same spacing as an SD card,” which made the whole thing possible. After modifying the data cable and pins, attaching a USB 3.0 adapter, and making some final adjustments, the SD Card floppy drive was up and running. The floppy drive is part of a larger project in which Dr. Moddnstine converted an IBM Aptiva desktop case from 1995 into a modern, Core i7-based PC. Be sure to check out the full photo album, and bask in its nerdy, retro glory.